Russ Cochran fondly recalls the fun he had with his chimpanzee when the animal was younger, taking him for rides in the car and to his cabin on the river. Boaters would stop to see Sammy, who would jump in canoes and help himself to food and drinks from the cooler. "That would be the price of admission for him," Cochran says. "He would drink beer if you let him. He liked beer." Now Sammy is a powerful 19-year-old with strength many times that of a human. He recently got into a vicious fight with Cochran's younger chimp, Buckwheat. That fight and news accounts of a savage chimpanzee attack in Connecticut that nearly killed a woman this year convinced Cochran that he didn't want to have two male chimps - the new pet, Buckwheat, had to go. But finding a new home for Buckwheat and other unwanted chimps isn't easy. Animal experts say dozens of chimp owners in the U.S. are actively trying to find new homes for their chimps, who are more dangerous than adorable when they reach maturity. The nation's sanctuaries are full with more than 600 chimpanzees, according to April Truitt, who runs the Primate Rescue Center in Kentucky. "There needs to be a place for these animals," said Cochran, who lives in West Plains, Mo. "I don't think people should have chimps as pets. I say that having had three of them." Some sanctuaries say they have received more calls since a 14-year-old chimp named Travis suddenly attacked Stamford, Conn., resident Charla Nash. She lost her eyesight, hands, nose, lips and eyelids in the attack and is now at Ohio's Cleveland Clinic in critical but stable condition. Travis, who starred in commercials when he was young, was kept as a pet and weighed 200 pounds when he attacked Nash on Feb. 16. He was shot and killed by police. There are about 235 known, privately owned chimps in the United States, according to Truitt, who did a census in 2003 and has continued to closely monitor the number. Owners of about 70 chimps would give them up if they could find a good home for them, Truitt said. She says she has gotten more calls from owners looking to give up their chimps since the Connecticut attack. Seven sanctuaries issued a statement last month saying they need more funding so they can offer a safe place to private owners who want to give up their chimps. They also called for states to ban the private ownership of chimpanzees and for the entertainment industry to stop portraying them as "cute hairy little people." "We cannot take in these individuals without a significant contribution to their lifetime care, so tragedies like the one in Connecticut will likely keep happening," the sanctuaries said. "In substandard facilities, they pose a significant public safety danger." One owner who spoke on condition of anonymity because she feared her neighbors' reactions said she has been trying for years to find a facility for her two chimps. "Travis was chimp 9/11," she said. "We have no life. We basically take care of them 24/7." The Connecticut attack was the latest in a series of incidents in recent years involving chimps escaping and biting people. In 2005, two chimps in California nearly killed a man, chewing off his nose, testicles and foot and biting off chunks of his buttocks and legs before they were shot to death. This spring in Missouri, authorities responded to a call to help capture an angry chimp running loose on a state highway. When officers arrived, the chimp opened the patrol car door and grabbed the leg of a deputy, who fatally shot it, police said. Chimps can live 60 years and cost about $15,000 per year to care for, according to sanctuaries. 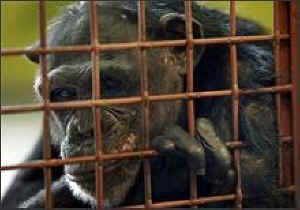 Zoos are normally not able to accept hand-reared chimps because of difficulty integrating them. Experts blame a handful of breeders and the entertainment industry for contributing to the problem. Travis starred in TV commercials for Old Navy and Coca-Cola when he was younger. At his Connecticut home, he watched television, ate at the table, drank wine from a stemmed glass, brushed his teeth and was toilet trained, according to a police report filed when he escaped in 2003. Legislation has been proposed in Congress to ban the transport of monkeys and apes across state lines for the purpose of selling them as pets. The importation of primates for the pet trade has been outlawed since 1975, but bill sponsor Rep. Earl Blumenauer, D-Ore., has said 30 states allow the keeping of the animals as pets and it is easy to purchase a primate from exotic animal dealers or over the Internet. "When you're holding a 2-month-old baby chimp in your arms and feeding him out of a bottle, it's a very special thing," Cochran says. "You think at the time it will be all worth it." Cochran, who spent about $25,000 for cages in his home, said one facility in Florida wanted $200,000 to care for his chimp. Cochran wound up finding a place in Texas that took Buckwheat for $10,000. The first six or seven years were wonderful, Cochran says. "Then puberty starts," he says. "When the hormones start to fly, it makes them unpredictable." Sammy bit off the tip of Cochran's little finger when the animal was 9, Cochran said. Cochran says he no longer thinks it was worth it to own the chimps. "On a retirement income, it's an expensive hobby," he says.